It is now relatively common that conversations happening at events can be captured on Social Networking Sites such as Twitter as well as physically in the room. What we want to demonstrate here is the potential of social media monitoring tools for analysing remote events. This post will showcase use of few simple tools that will be incorporated as part of the newly designed Edinburgh University training programme in Making Use of Digital Research. Between the 16th and the 17th of September 2014, an Analyst Relations Forum was held in London and brought together well over 20 keynote speakers and workshop leaders. The event was well attended both on site and on social media sites. Is UK AR scene tightly connected? Use of social media monitoring tool Tweetbinder allows us to test the hypothesis that UK analyst scene is more tightly connected that AR communities in other countries e.g. US or Europe. With regards to connections within the group, as visible in the above table, relatively many retweets occurred with equally significant replies (65.29% retweets and 3.19% replies). Pointing towards a denser network is also the high number of tweets per contributor. Both these matrixes display a very active community. People read and engage and comment on previous tweets. 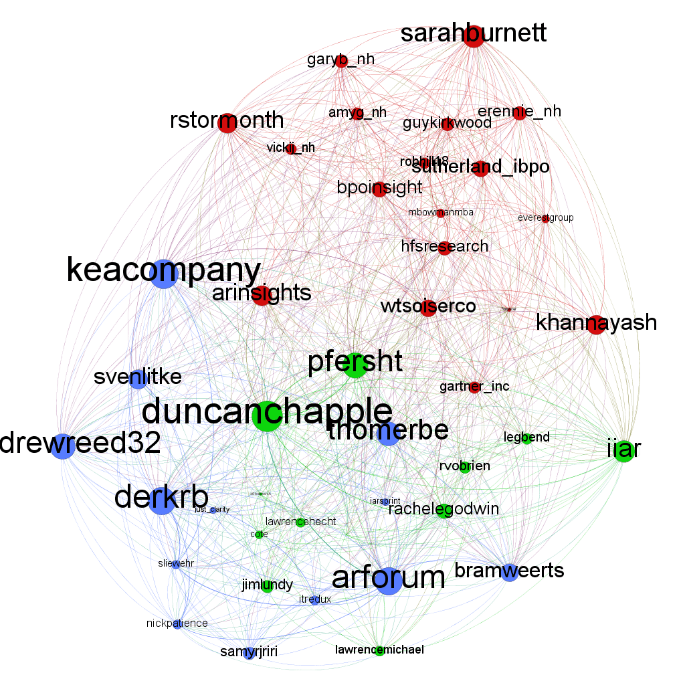 Further analysis (see graph below) unveiled that everybody tweeting about the ARForum knows at least two other people at the conference (and 28 users know at least more than 20). Average follower per contributor is 1.414, which is around 10 times higher than the average Twitter user. 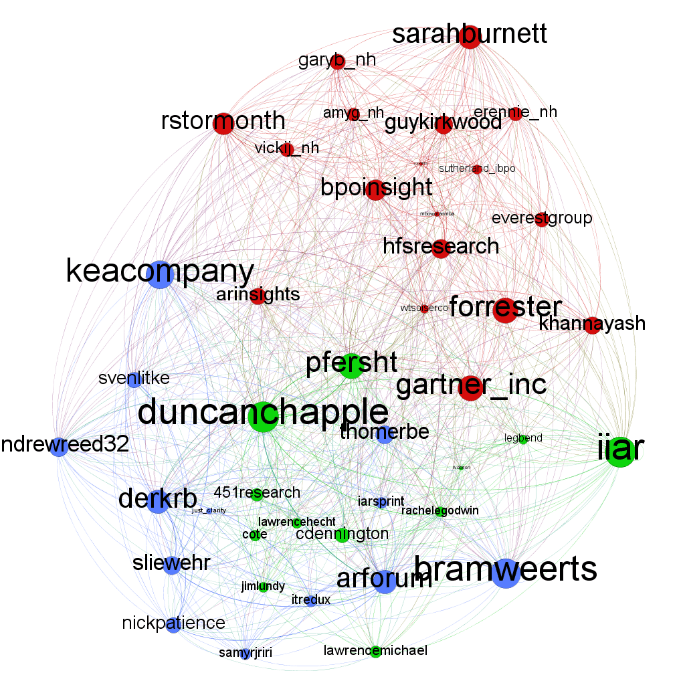 This tells how rich UK analyst relations’ connections are. This data also tells about the level of adoption of Twitter by Analyst Relations, confirmed by a high number of tweets during the event with 4.52 tweets per contributor. The hypothesis that UK analyst scene is more tightly connected can be tested by applying a similar analysis to a US based AR event. If there will be one twitter user tweeting about the event who knows less than two other people under the event hashtag, this can verify the conjecture that the UK scene is more densely connected. It is not unusual for a user organisation to find itself assessed as the best on one analyst ranking, amongst the worst on another, and not listed whatsoever on a third. Operating in this context of multiple influencers, the implication of our finding is that by being more tightly coupled, the UK AR community can provide a better service by controlling this heterogeneity and preventing their clients to be pulled in different directions. Looking at the whole network generated using social networking tool Gephi, it has been found that although keynote speakers were mentioned massively during their talks, the in-degree (communication to user) and out-degree (communication from user) are relatively equally distributed confirming the theory of UK AR community as a dense horizonal peer-to-peer network. In-degree (left) and out-degree (right) are hereby represented by the size of the users node. Another conjecture emerging from initial conversations is that AR need to develop better ways to “listen” to analysts rather than just giving them information, thus creating a more two-ways relation. Our findings demonstrate that at least for what concerns Twitter data, the relation between AR and analyst is not one of reciprocity yet. Despite the dense network, three clusters have been found (green, blue and red). While the blues (AR Company organising the event) have interwoven relationships with greens (other AR companies), the red cluster (analysts cluster) is less connected. Furthermore, analyst relations are more connected with analyst companies like Forrester, Gartner and NelsonHall (@bpoinsight) rather than to individual analysts (e.g. Sarah Burnett). This is unusual as in Twitter personal accounts are generally more followed than firm-level accounts. In fact, firm-level accounts hardly reciprocate. This finding can tell that relations between analysts and analyst relations, and in particular the way analysts relations “listen” to analysts, still need strengthening. One of the assets of newly developed Edinburgh University training in “Making Use of Digital Research” is to lower barriers to access digital research. Systematic extraction of data from Twitter can be time consuming and may require server space. However, with this post we wanted to demonstrate that with access to just a personal computer and freely available tools interesting findings can be generated. For analysis we used Tweetbinder (http://www.tweetbinder.com/), an easy-to-use online tool that doesn’t require installation. You just need a Twitter account to start collecting data. Tweetbinder is particularly useful if you want to have a quick overview on what is happening on a certain hashtag. To accomplish analysis of networks and connections, we used NodeXL. NodeXL (nodexl.codeplex.com) is a free add-on to Microsoft Excel. Please note that streaming data from NodeXL may be the easiest way, but it is restricted to Microsoft as it is based on Excel and it is limited to the available Twitter datastream (hence it could take longer for a larger amount of data that needs to be scraped). For the visualisation itself, NodeXL can be used for basic visualisations such as in-degree and out-degree. For this example we used Gephi (https://gephi.github.io/) which is also open source and available on all operative systems including Mac. This entry was posted in 3. Engage & Influence, Guest Post, Research. Bookmark the permalink.